Larca lata, copyright John Hallmén. 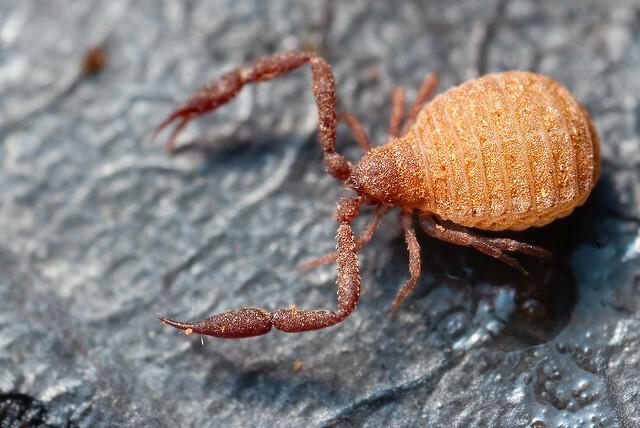 The Panctenata are a clade of pseudoscorpions characterised by features of the chelicerae, including the presence of a velum (though this is absent in some olpioids) and lamina exterior (Harvey 1992). Synapomorphies (from Harvey 1992): Velum present; lamina exterior present; movable cheliceral finger with one or two distal teeth or lobes; seta gs of movable cheliceral finger subdistal; serrula exterior completely fused to movable cheliceral finger. Harvey, M. S. 1992. The phylogeny and classification of the Pseudoscorpionida (Chelicerata: Arachnida). Invertebrate Taxonomy 6: 1373–1435. [H08] Harvey, M. S. 2009. The first Australasian species of the halophilic pseudoscorpion genus Paraliochthonius (Pseudoscorpiones: Chthoniidae). Records of the Western Australian Museum 25 (3): 329–344. [HL08] Harvey, M. S., & M. C. Leng. 2008. The first troglomorphic pseudoscorpion of the family Olpiidae (Pseudoscorpiones), with remarks on the composition of the family. Records of the Western Australian Museum 24 (4): 387–394. [M90] Muchmore, W. B. 1990. Pseudoscorpionida. In: Dindal, D. L. (ed.) Soil Biology Guide pp. 503–527. John Wiley & Sones: New York. [MHG08] Murienne, J., M. S. Harvey & G. Giribet. 2008. First molecular phylogeny of the major clades of Pseudoscorpiones (Arthropoda: Chelicerata). Molecular Phylogenetics and Evolution 49: 170–184.